This test complies with the OECD and ISO guidelines as one of the three levels of in vitro tests for genotoxicity and follows the AAMI/ANSI/ISO/10993-3, AAMI/ANSI/ISO/10993-1, AAMI/ANSI/ISO/10993-12, and OECD 471 standards. 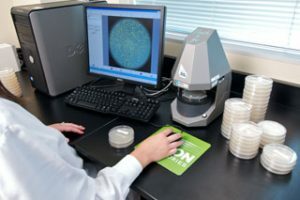 The tests are performed by mixing an extract of the test article with the test organism in a soft agar solution, which contains only small amounts of histidine. The histidine permits the inoculated test organism to undergo a limited number of divisions, but is insufficient to permit normal growth. A spot test is also performed in which the extracts of the test article are spotted on a plate containing the test organism with a small amount of histidine. As the test substance diffuses through the agar, it becomes more dilute. This allows for detection of mutagens which cause some inhibition of the tester strains. The tests are performed both with and without S-9 activation. The S-9 activation system is designed to simulate mammalian liver enzyme systems and is used to detect substances which undergo metabolic activation from non-mutagenic forms.